Our venue moodlighting can transform any venue, by making even the most stunning venue look even more stunning. 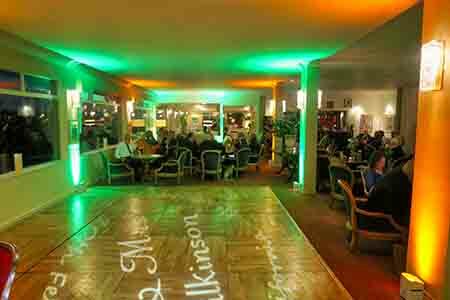 We can quickly and easily add a new lease of life to any venue with our amazing moodlighting. These are the very latest top of the range units, they are fully wireless and computer operated. They include Red, Green, Blue, Amber, White and UV which means we can reproduce almost any colour in the visible spectrum, including silvers, golds, orange and whites which are impossible on Red, Green and Blue only moodlights. Our Venue Moodlighting Totally Transforms Any Venue. These are very powerful 60 watts per unit, however with our wireless computer control we are able to dim them so that we get the exact contrast for the venue they are in. We can set them to virtually any colour, we can make them do chases, slow or fast fades, static colours, strobing, pulsing, popping, sound to light and much much more. These make the most stunning venues look even more spectacular, they will totally transform the blandest or dingiest looking venue to look absolutely amazing in an instant. Unlike the horrible silver ashtray looking uplights which can only produce a single off white light and are usually always installed in marquees by the marquee company, our moodlights do not get hot, they are totally child friendly, so they are not going to burn their hands should they touch the units. 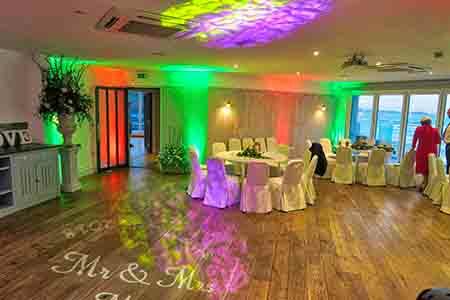 We can match our venue moodlights to go with your wedding colours or we can match it to your colour scheme. 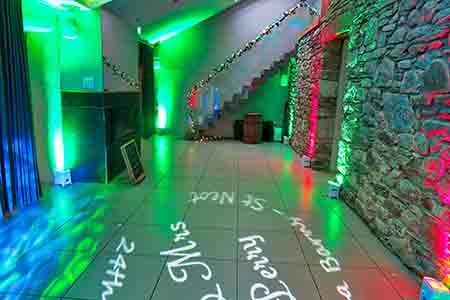 We can also use our moodlighting to enhance your party by incorporating it in with the music and the vibe of the party at any given time. For example, we can match it with our other lighting for the first dance. 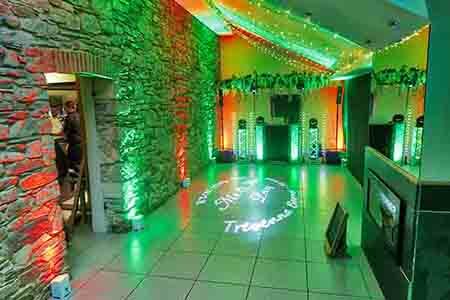 Or later in the evening when the party is really in full swing we can have the whole venue flashing or fading to the beat of the tracks being played. If we are playing a softer slower song we can tone it down to meet the vibe, should you need the room nice and bright, we can switch them all to white. The possibilities really are endless and the difference they make really is quite dramatic.